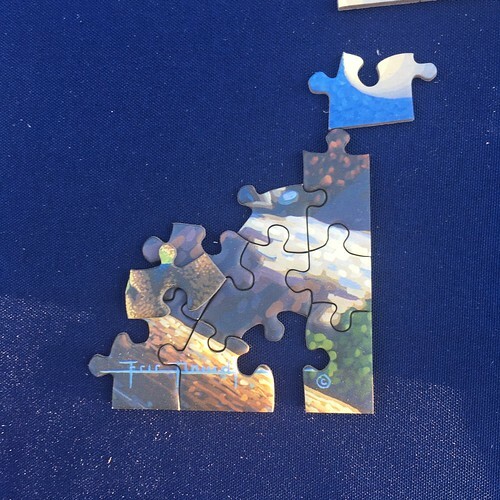 Solve the puzzle to see where they will be honeymooning... okay... I contributed and another young lady about 12 helped me get most of the straight edges... I saw an eagle in the sky, pine trees, a black bear, a deer, and a sign with some word ending in "ONE". I did this while waiting for line to taco bar and then became fixated as I listened to many different stories and visited with people as they passed by as they were in line. Cudos to the 10 people who actually contributed at least on of the hundreds of pieces to the solution which was designed for us NOT to solve. YES! I WAS bumming that I could seem to find this ONE piece before I left which would have completed the artists name. UGH. I KNOW it's in there somewhere LOL.